Saturday, my beloved husband took me to Bishop's Attic. Bishop's Attic is a local thrift store that's just the absolute definition of thrift store to my mind. They will sell almost anything they are donated. There are half tubes of paint, fabric, books all over the place and my favorite is their 3/1.00 "work clothes" rack. Jeans, button down shirts, teeshirts, all sorts of things that are a little too worn or a little too stained for most places to sell, but they do sell them. 34 cent jeans are great for upcycling! I spent 20 dollars and walked out with 8 books including 2 new old craft books for my collection and a few cookbooks, a bunch of fabric for The Turnip including a scrap of a loteria print which I might steal a piece of for a pin, a skirt each for The Turnip and I. Mine is a plain black skirt, hers is a wild diagonal pink stripe she loves and wore with complete disregard for fashion with a red blouse and a blue diagonally striped tie, and a nice bunch of dpns. Some incomplete sets but incomplete sets make nice hair sticks. 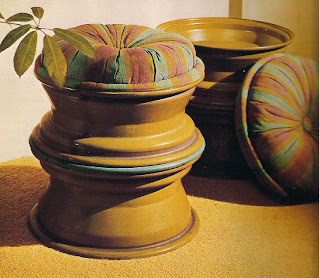 One of the craft books was Better Homes and Garden's Treasures from Throwaways published in 1976. Some of the ideas in it are brilliant. Closer to Christmas I'll post scans of my 2 favorite Christmas ideas. I really loved this idea for a stool to sit on. Pretty sure I can get a couple old tire rims if I ask around. The cushions are sewn to fit. I imagine you could use the depression on the insides of the rims for some storage as well, or strip the hardware off an old door and make a coffee table using the same idea. The real treasure was this. Nifty enough. 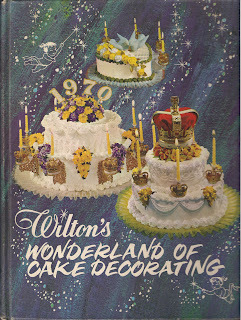 I love old cake decorating book, but what made it just wonderful was the inside cover. 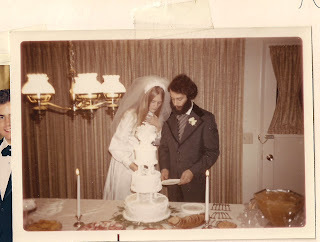 I think the person who owned it originally did wedding cakes and took pictures of them. Aren't those brides lovely? The lines of their dresses are so gorgeous. I do so hope they had their happily ever afters. 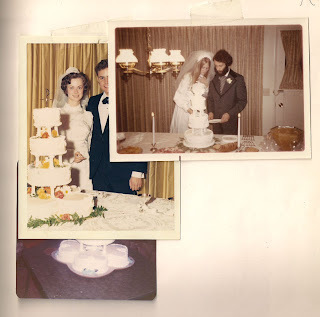 What a great treasure hidden in the cake book! I love finds like that! 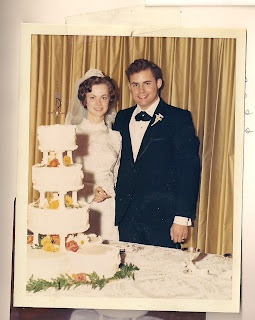 I love the pictures of the brides & grooms--very cool. Great find. If you want vintage craft books just go to your public library. Since most libraries are woefully underfunded most of their books are from the 40's - 70's. Here in Chicago I found a knitting book from the 30's.